Repair Grass Damaged by Dog Urine. 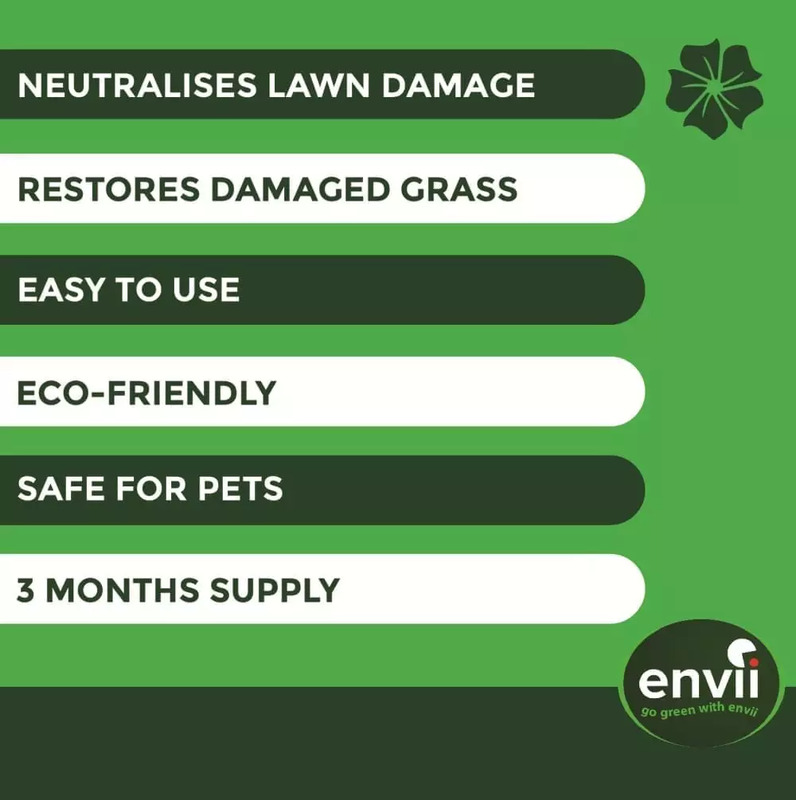 Treat Your Grass, Not Your Dog! As if looking after your lawn wasn’t already a chore, now you have to repair burnt grass patches caused by your beloved mutt! Several products claim to prevent your dog’s urine causing lawn burn, from supplementary tablets, to stones in your dogs water. To prevent lawn burn, these products remove nutrients from your dog’s diet, or make their urine weaker by changing its pH. Obviously we don’t want to mess with a dogs health or diet so Neuturine treats the grass, not the dog. Each tablet contains millions of beneficial bacteria to break down the nitrogen in dog’s urine that causes lawn burn. By removing the nitrogen from the soil, you improve soil quality and allow grass to grow happily again. 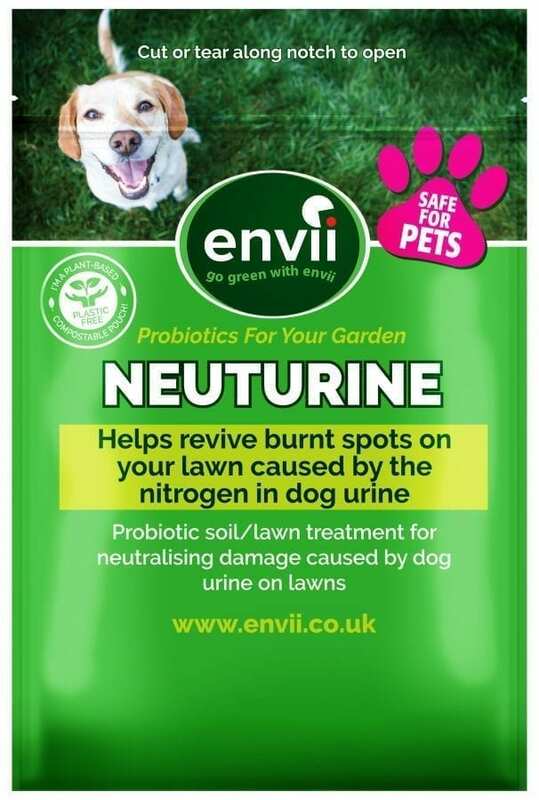 Neuturine will not only repair grass effected by dog urine, but it can also prevent lawn burn when used on a regular basis. 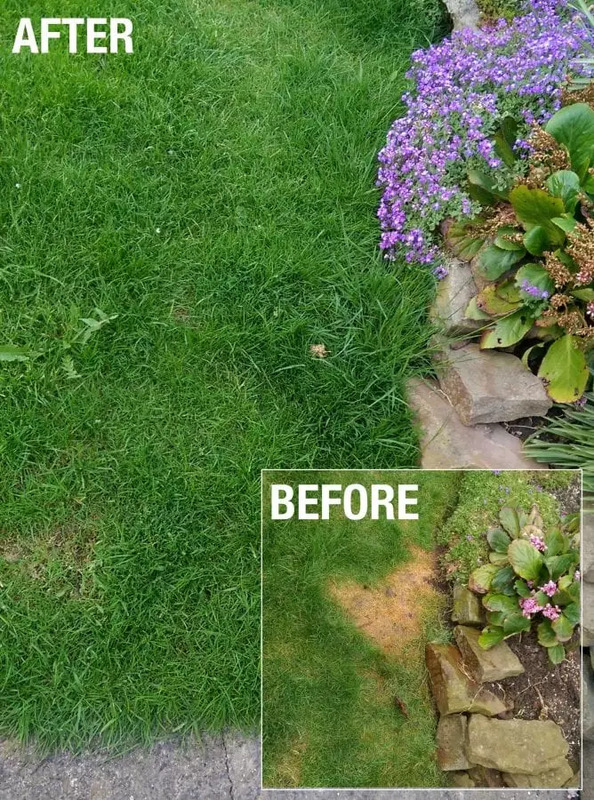 The presence of beneficial bacteria means that as soon as your dog does do their business, the bacteria can begin breaking down the nitrogen before it has chance to effect your lawn. By treating the grass rather than the dog, you don’t have to worry about fighting with your dog each month to give them a tablet or risk them eating a sulphur rock, it happens! Dog urine contains concentrated levels of nitrogen which eventually breaks down to ammonia and burns the lawn. You may have noticed that the grass around the edge of a lawn burn patch grows much quicker. This is because the nitrogen found in dog urine is a fantastic fertiliser. As it leaches out into the grass and naturally dilutes through the soil, it improves the growth of grass. In the centre of the patch, where the urine is at its most concentrated it burns the grass. 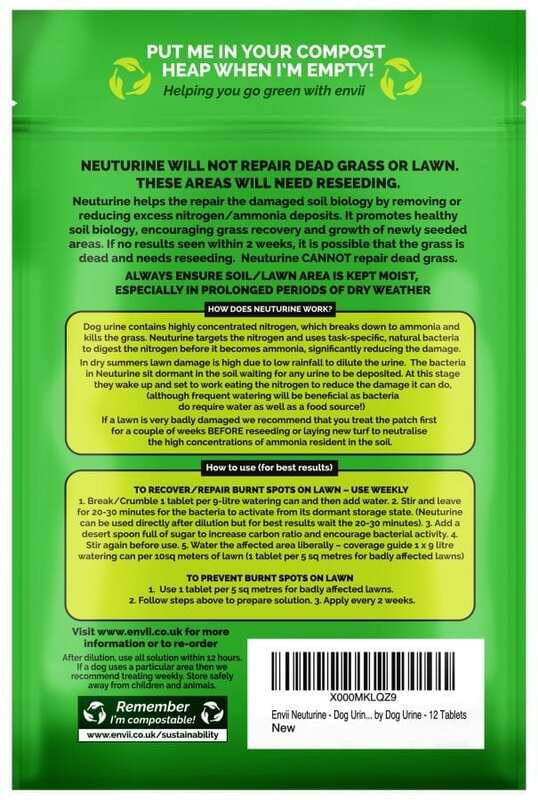 Neuturine will repair burn patches, but if the grass is completely dead, it will not regrow and will require re-seeding. However, Neuturine will reduce harmful nitrogen levels in the soil and produce the perfect growing environment for new grass seed. Add a spoonful of sugar to the solution before applying to the grass. This will give the bacteria a carbon source and help it perform better. It varies on the condition of the lawn and how old the patches are but we usually say within 4 weeks. Will it eliminate the urine smell? Yes, the bacteria targets the nitrogen in the urine to stop it from breaking down and causing a smell. Is this safe for all pets? Yes, neuturine contains only natural ingredients and is safe for all pets. Even when they accidently eat one, which has happened to our dog Ralph!